The land for the Marae site was legally gifted by the owner, Tuura Rewha Hira. It was designated a Maori Reserve in 1846 named Omakiwi because it was part of large land block called Omakiwi, centred in the present bay of the same name, between Taiharuru Bay and Kokinga Pa.
Before this gesture by Tuura, hui were held in the bigger houses on the peninsula. Wiremu Paaka’s large house in Hauai Bay was a gathering place, as were Rewiri Ahitapu’s in Kaingahoa Bay and Ihaka Te Tai’s house at Te Kauri. 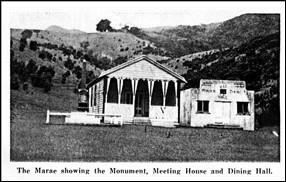 The present wharehui was built then opened in 1910. To build the wharehui, every whanau donated its time, materials, goods and labour. It was built as a labour of love. Whanau then cooked for manuhiri in a tent to the side of the wharehui with the open fire under a makeshift shelter. Whanau members built the wharekai (kitchen/dining room) after the Second World War and opened it in 1947. Its style was Mediterranean stucco, popular at the time. This was post World War II when our men had returned from Mediterranean countries singing Italian songs and using Italian words. 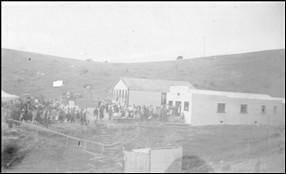 It was named The Rawhiti War Memorial Dining Hall to commemorate the men who fought and who died. It had, at the back, the open fire with the wide, high, corrugated iron chimney above it. A long metal rod held the large cauldron pots. Dishes were washed in double wooden tubs, like laundry tubs. The toilets were of the long drop style, as visible in the foreground of the photo to the left. Notable also is the lay of the land. The toilets sit on the slope of the small valley opposite slope of the dining hall site. It was a long walk in the dark and rather a dangerous one, particularly in pre-electricity times. 3 Responses to "The Early Development Stages"
Nei ra te mihi kau ana kia koutou mo o koutou kaha ki te whakaako ia matou uri whakatupuranga o Ngati Kuta. koina ko te marae o aku tamariki otira taku tane a Poutai Rewha ahakoa e noho ana matou ki Ngaruawahia e mohio pai ai a matou tamariki ki ngo ratou whanaungatanga ki Te Rawhiti.